Griezmann: FIFA Award Snub Is "Bizarre"
Antoine Griezmann thinks he should be in the running for the Ballon d'Or after the "bizarre" decision to omit him from the shortlist for the Best FIFA Men's Player award. The 27-year-old inspired Atletico Madrid to victory in the Europa League last season before going on to play a starring role in France's triumph at the World Cup. A UEFA Super Cup prize with Atletico followed last month, but it was not enough to place him among the final three nominees for FIFA's top individual award, which will go to Cristiano Ronaldo, Luka Modric or Mohamed Salah. 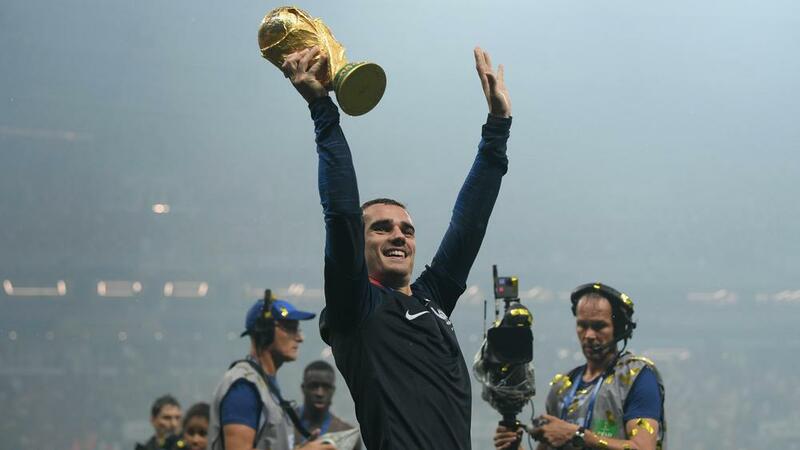 Griezmann thinks it odd that no France player is in the running given their World Cup success, but he believes he is closer than ever before to the Ballon d'Or, having still finished third two years ago despite defeats in the Champions League and Euro 2016 finals. "I think about it, especially as I'm closer and closer," he told L'Equipe. "When I came third in 2016, I lost two finals. This time, I won three. "The Ballon d'Or is a prestigious award and, for a player, it's the pinnacle. There is none better, none higher. There might be trophies in your league, in the World Cup, in the Euros. It's not the same. "I would ask myself what more I can do. I won three, trophies, I was important in decisive moments. But it's not my vote. "Comparing 2016 and this year, for me, I'm obliged to be in the final three." When asked about his omission from the FIFA Best Men's Player running, he replied: "It's bizarre. And a pity. It's a trophy FIFA gives, no? And the World Cup is organised by FIFA, yes? We won the World Cup and nobody from France is there. It's a choice, but the fact there is no world champion is surprising." Griezmann admits he believed France would win the World Cup immediately after their victory over Belgium in the semi-final, as he felt the pressure had been eased at last. "After the final whistle after Belgium [I knew]," he said. "That's why I'm crying on the pitch. I knelt down and started crying. The guys came around to me and said 'No, wait, there's still a match left!'. "I had confidence in how we would play the final, regardless of the opponent. After the semi-final, the stress left. I was happy." France won that final in Moscow 4-2 against Croatia, with Griezmann and Paul Pogba both on the scoresheet. The Atletico Madrid star hailed Pogba for his performances and leadership qualities in the tournament and has urged him to continue in the same vein for Manchester United. "Paul has really gone up a notch in the dressing room," he said. "He had the right words, which pushed us. Hugo [Lloris], Raph [Varane] and Blaise [Matuidi], we knew they were there, but Paul, yes, he surprised us more and it made us feel good that he spoke like that. "Every time he speaks, I want to laugh! He's so used to messing around that it surprised me. That's why, when he talks, he never looks at me. He knows I'll smile a little and he can laugh at any moment. "The 'Piochy' we saw at the World Cup is the one I know. He gets the ball and plays fast. He took a lot of confidence from the World Cup. Now, he mustn't change. He must be like [N'Golo] Kante: he wins the ball back and gives it to the forwards."